Jenny Ban Creates: I need this! I woke up this morning to see that Beckie at Knock Off Decor posted a table I NEED to make for my living room. My husband has been asking me to buy one of these things for, oh, two years or so (ever since my laptop took residence on the end table and he had visions of me becoming a youthful hunchback). But this one is so much more awesome (and cheap!) than the ones I have seen out there. 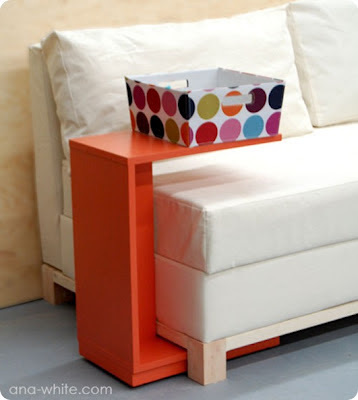 I actually like it better than the inspiration table from CB2, although it might just be that it reminds me of the orange formica bunch tables we had in my family room when I was little. Anyhoo, I'm adding this one to my ever-growing project list. If you want to make one too the project plan is here. Hi Jenny! This is a great idea! I may need to get a new couch to go with it... my couch goes all the way to the floor. Boo. Love the blog! Great job! Your cards are cute. I'm not sure it will actually work with our couch either. How practical is it to buy a new couch to make your decor hack table work? :) Thanks for the compliments, too! I love that it reminds you of our bunch tables! Only this actually looks much better!